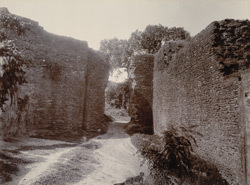 Photograph from the Curzon Collection, of a breached wall in Dig Fort, Rajasthan, taken by the studio of Priyalall & Company in c.1900. Dig was established as the first capital of Bharatpur state by the Sinsini Jat Badan Singh (ruled 1722-33) when he was proclaimed Raja of Dig in 1722. The fort was built by his son Suraj Mal (ruled 1733-63) in 1730. The breach in this view is probably a result of the battle fought there in 1804 between Jaswant Rao Holkar's army and British imperial troops under Lord Lake. In November 1804 General Frazer defeated Holkar’s army close to Dig, and pursued routed soldiers to the fort. After being besieged the fort was carried by storm on 23 December 1804.